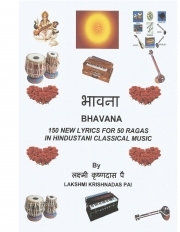 A Hindustani Classical Music Book of 50 ragas, with 150 new "bandish (lyrics)", "swaralipi (notations)" and "raga description". where she worked as a Lecturer. A performing artist of Hindustani Classical Vocal Music, she is also a composer, teacher, and a poet. Krishnadas and Lakshmi have made their home at Nisarga Layout, Bangalore.